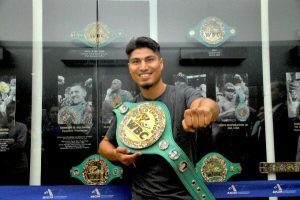 For the second time in as many fights, Mikey Garcia has elected to vacate an alphabet title in pursuit of bigger game. The unbeaten lightweight titlist and pound-for-pound entrant has agreed to relinquish his International Boxing Federation (IBF) lightweight title in lieu of satisfying a mandatory title defense versus Richard Commey. IBF spokesperson informed BoxingInsider.com that Garcia had formally notified the New Jersey-based sanctioning body of his decision, confirming a news story first reported by ESPN.com senior writer Dan Rafael. The move comes ahead of a second ordered purse bid between Garcia and Commey due to defaulting on a previously reached verbal agreement. Garcia (39-0, 30KOs) inherited the mandatory challenge following his points win over previously unbeaten Robert Easter Jr. in their unification bout this past July. Both boxers entered the contest with the understanding that the winner would be immediately ordered to next face Commey, with the IBF granting Easter Jr. such an exception in order to pursue the aforementioned title unification clash. With Garcia scoring a landslide decision, he was on the hook to satisfy the overdue mandatory title defense which was ordered by the IBF on August 1. The first ordered purse bid was canceled after Richard Schaefer (representing Garcia) and Lou DiBella (Commey’s promoter) informed the IBF and various media outlets—including BoxingInsider.com—at the time that a verbal agreement had been reached. However, Commey was the only party to send back a signed contract. When Garcia failed to do so within the 15-day period assigned by the IBF, the agreement was considered null and void with a new purse bid hearing scheduled for Tuesday. By that point, speculation had run rampant that California’s Garcia—who has won titles in four weight divisions—would be moving up to welterweight in pursuit of a challenge versus unbeaten Texas native Errol Spence for his welterweight title. The matchup had been rumored for several weeks, but never evolving past casual conversation. Because the mandatory was overdue, Garcia could not file for an exception which factored into his opting to vacate in lieu of being stripped for the title. Commey (27-2, 24KOs) will now make his second attempt at a lightweight title, both coming in vacant title fights. His first bid ended just short, going tooth and nail with Easter Jr. in dropping a competitive decision in their Sept. ’16 shootout. The Ghana-bred boxer was similarly edged out in a title eliminator just three months later, losing a split decision to Denis Shafikov. Three straight wins have followed, including 6th round knockout of previously unbeaten Alejandro Luna in their final eliminator this past March. The bout took place on the Showtime-televised undercard to Garcia’s 140-pound championship winning effort over Sergey Lipinets—interestingly with Garcia vacating the bout soon thereafter as he opted to return to the 135-pound division. His drop back down in weight turned out to be for just one night, at least for now—a familiar pattern since his return the sport in 2016 following a 30-month forced hiatus. All five of Garcia’s bouts in his second career have taken place between 135-140 pounds, although barely staying in the same place for very long. His 3rd round knockout of then-undefeated Dejan Zlaticanin to win a lightweight title in Jan. ’17 was followed by a pair of 140-pound bouts, scoring a points win over Adrien Broner last July and then Lipinets. In his pursuit of Spence and a title in a fifth weight class, Garcia—who spent the first eight years of his career fighting at 126 and 130—would be making his welterweight debut. While he still holds a lightweight title, that reign could too be in jeopardy. Still awaiting the 30-year old is a mandatory title defense versus Luke Campbell, who earned his second title crack following a decision victory over Yvan Mendy in September to avenge his lone defeat. Meanwhile, Commey will soon enter negotiations with the next leading available contender for the IBF lightweight title. The current next highest-rated lightweight is Russia’s Isa Chaniev (13-1, 6KOs), who has won three straight including a career-best decision win over former lightweight titlist Ismael Barroso this past May in Riga, Latvia.